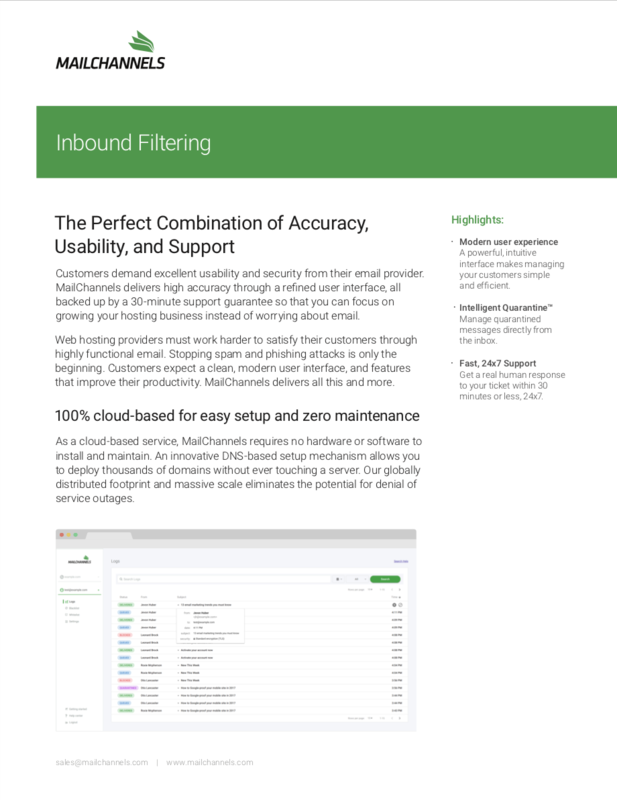 MailChannels Inbound Filtering is a cloud-based spam filtering service designed to help web hosts protect their clients from malicious email threats. It is a reliable, cost-effective service for businesses of all sizes. A powerful, intuitive interface makes managing your customers simple and efficient. Receive a personalized daily quarantine summary via email and release quarantined messages directly from the inbox. Get a real human response to your support ticket within 30 minutes or less, 24x7. MailChannels provides email security solutions for both inbound and outbound spam filtering with near-perfect service availability. The MailChannels cPanel plugin allows you to deploy MailChannels to thousands of domains quickly. MailChannels offers fast, 24x7 email support with an average response time of less than 30 minutes.